1. Heat the oil in a pan, fry the red chillies and take it away from the oil and keep it aside. 2. In the same oil, sauté the chopped onion till it becomes golden in colour. 4. Soak the tamarind in water for 5 mins. 5. Then add onion, chillies, tamarind and salt in blender and grind them to make a paste. 6. No need for tempering. 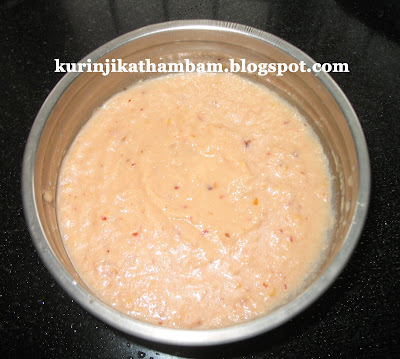 As it is in baby pink colour, we call it is as Roja chutney. It goes well with Idlys and Dosas.